SEATTLE, Washington, September 23, 2015 (ENS) – In a meeting with Chinese President Xi Jinping, a bipartisan group of five U.S. governors Tuesday signed an accord with six Chinese governors to promote clean energy technology and economic development. “We have a shared opportunity and interest in helping lead the world in the transition to a clean energy future,” said Washington Jay Inslee, who hosted the meeting. “It’s encouraging to see governors from different sides of the ocean, and different sides of the aisle, coming together to do our part to make sure our children will thrive in a forward-thinking economy that reflects our commitment to protecting our air and water,” said Inslee. The Governors’ Clean Energy and Economic Development Accord establishes an agreement to collaborate on commercialization and deployment of clean and renewable energy technologies, promote energy efficiency, advance smart grid infrastructure, reduce transportation emissions, and improve air quality. The bipartisan group of U.S. governors included: California Governor Jerry Brown and Oregon Governor Kate Brown (no relation), both Democrats, Iowa Governor Terry Branstad and Michigan Governor Rick Snyder, both Republicans. Nevada Governor Brian a Republican who was unable to attend the meeting in person, also signed the accord. Chinese governors in attendance were Beijing Mayor Wang Anshun, Chongqing Mayor Huang Qifan, Shaanxi Governor Lou Qinjian, Shandong Governor Guo Shuqing, Sichuan Party Secretary Wang Dongming, and Zhejiang Governor Li Qiang. 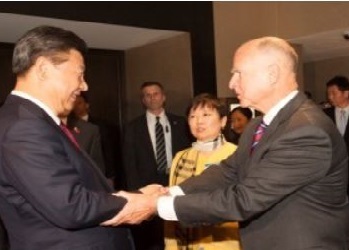 Bolstering California and China’s economic and environmental partnership, Governor Jerry Brown co-chaired the Third U.S.-China Governors Forum and announced the first Chinese province – Sichuan – to sign on to the Under 2 MOU climate agreement. Also on Tuesday, executives of Terra-Power Inc., a company founded by Microsoft founder Bill Gates, signed an agreement with China National Nuclear Corp to cooperate in the development of next-generation nuclear power plant technology.